Maria Diuk-Wasser at the Yale School of Public Health believes the onset of human-induced global warming is likely to increase the infection rates of mosquito-borne diseases like malaria, dengue fever, Zika and West Nile virus by creating more mosquito-friendly habitats. As tropical diseases cross borders, avoiding mosquito bites is the best way to prevent diseases. Zika virus hit the world stage when it was linked to birth defects in Brazil, finally prompting the World Health Organization to declare a global health emergency on February 1st, 2016. Zika virus (ZIKV) is commonly transmitted by the bite of an Aedes mosquito. However, it can also be transmitted via blood transfusions, sexual contact and from mother to child if the mother is infected with the virus during pregnancy. To date, there is no evidence of Zika being passed from mother to child via breastfeeding, and Zika-infected mothers are still encouraged to breastfeed their children. Symptoms of Zika are generally mild and often mistaken for dengue fever. Common signs to look out for include a slight fever, headache, rash, conjunctivitis, as well as joint and muscle pain. Because there is no vaccine or cure for Zika, preventing mosquito bites is considered the best protection against the virus. Treatment is focused solely on relieving the symptoms i.e. bed rest, drinking fluids to stave off dehydration, and taking pain and fever medications. West Nile virus (WNV) is transmitted to a human by a mosquito that has first bitten an infected bird. Most people who get infected with the virus will have either no symptoms or mild symptoms including: fever, headaches, body aches, tiredness and loss of appetite. 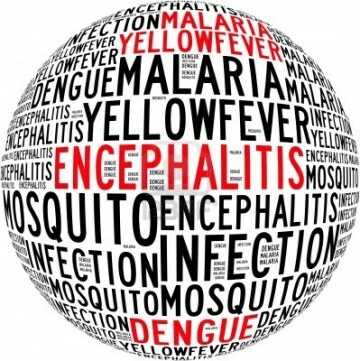 A few individuals will have a more severe form of the disease, encephalitis (inflammation of the brain) or meningitis (inflammation of the tissues that cover the brain and spinal cord). Health officials say that individuals over age 50 are at higher risk for serious illness. There is no specific treatment for West Nile virus. Notable rises of Dengue Fever in parts of Latin America and Australia together with the first documented outbreak in Florida(2010) in 75 years are warning signs that global warming is creating new breeding grounds for diseases long confined to subtropical climates. Dengue fever is transmitted by the bite of an Aedes mosquito infected with the virus. The mosquito becomes infected when it bites a person with dengue virus in their blood. It can’t be spread directly from one person to another person. Symptoms are generally mild and often mistaken for those of the flu. Young children and people who have never had dengue before tend to have milder cases than older children and adults. The disease is rarely fatal but occasionally progresses to dengue hemorrhagic fever a more serious illness with abnormal bleeding and very low blood pressure. The symptoms may progress to massive bleeding, shock, and death. This is called dengue shock syndrome (DSS). Like most viruses, there is no specific treatment. Doctors recommend acetaminophen, plenty of fluids and rest for dengue and hospitalization for hemorrhagic fever. Chikungunya fever is a viral illness that is spread by the bites of infected Aedes mosquitoes. The fever typically lasts from five to seven days and frequently causes severe and often incapacitating joint pain which sometimes persists for much longer periods. It is rarely life-threatening. There is no specific treatment for the disease but analgesics and non-steroidal anti-inflammatory medication may be used to reduce the pain and swelling. Aspirin should be avoided. Once a sporadic problem in Africa and Asia Chikungunya disease has been expanding its range with outbreaks documented in Italy and France. Laura Harrington, a medical entomologist at Cornell University, has warned New York City could be next. That’s because one of the mosquitoes capable of spreading the virus, Aedes albopictus (Asian tiger), is already well established in the New York/New Jersey area. Since January 2014, fifty seven U.S. residents have reportedly brought Chikungunya home after traveling through the Dominican Republic, Haiti, Martinique, St. Martin, and Indonesia. People with malaria often experience fever, chills, and flu-like illness. If not treated, malaria can quickly become life-threatening by disrupting the blood supply to vital organs. Quinine and other anti-malarial drugs including artemisinins are prescribed and work by attacking the parasites in the blood. Derived from an ancient Chinese herbal remedy, artemisinin has long been considered a wonder cure for malaria. Fast-acting, with few side effects, it was almost 100 per cent effective. About 1,500 cases of malaria are diagnosed in the United States each year. Almost all are in travelers and immigrants returning from parts of the world where malaria transmission occurs, mainly sub-Saharan Africa and South Asia. Antimalarial drugs are available in the United States by prescription only however in many parts of the world, the parasites have developed resistance to a number of malaria medicines. Researchers have identified artemisinin-resistant strains of the malaria parasite in Western Cambodia. Reports of drug resistance in the area first emerged in 2008 and the problem has since spread to other parts of South East Asia.